Indian woman submitted to ‘Quest for Happiness’ on National Geographic. Kristian Bertel has contributed to the National Geographic Your Shot community with an assignment called ‘Quest for Happiness‘. Curated by Matthieu Paley, a National Geographic photographer this assignment is about to photograph happiness. We should think about what happiness is meaning to ourselves and think about what things that makes us happy and is it being close to loved ones or being part of a community or having good access to an education or health facilities. Nat Geo would like us to photograph what makes happiness. As Matthieu is saying it: ”- You may immediately have ideas to photograph obvious moments like someone smiling or a couple sharing a tender embrace, but please try to see deeper than an outward emotion. Show us the ingredients necessary in society to create a sense of happiness in a population. Create a strong image that will expand our understanding of what brings happiness to people in different cultures and environments. Does having easy access to the outdoors bring happiness? What about a clean environment, a sense of safety or a neighborhood that is united? I know this might sound difficult to achieve. Think about happiness in a deep sense, but remain factual and evocative in your image, walk the fine line between poetry and facts”, he says. Everyone wants it just as the Indian woman in the city photo above, but very few people really say they are lucky. It is often just a matter of perception. We explain what happiness is and how you can find your own happiness. There are instructions to be happy, some people claim to have leased the luck, others wish they had it. But basically, one question must first be answered in order to track down the phenomenon of luck. ”Happiness is basically nothing but the courageous will to live by accepting the conditions of life”, was how the French writer Maurice Barrès once defined the term ‘happiness’. Describing subjectively influenced and perceived happiness in a definition as an objective thing is simply impossible. But tried in ancient times people to capture the happiness and its backgrounds. Today, it is generally believed that one is a blacksmith by heart and happiness is the interplay of deliberately made decisions and coincidences. Personal freedom is strongly influenced by social obligations, but you do not have to be distracted by it. Because if you already start a family at 30, build your first house at 35 and buy your second car at 40, then you will decide. If you want to turn your hobby into a career at 45, then do it. If you want to sell your house at 60 to sail around the world by boat, no one can ban you. Only you determine your life but too often we forget this. Other factors of happiness can be the social environment, family conditions and health. So one can ask oneself if one is perfectly happy. In Hinduism the ultimate goal of life is happiness, in the sense that duality between Atman and Brahman is transcended and one realizes oneself to be the Self in all. Happiness is not the same as luck. In today’s happiness research, two types of happiness are distinguished, which are the happiness of life and random luck. Factors such as family, love, occupation, finances and leisure have an influence on the happiness of life not only in India but many other places in the world too. Aspects that one can partly influence ourselves and are partly dependent on society. The happiness of life can also be a kind of well-being that gives you a happy feeling. For instance, if you really feel at home, have a great circle of friends or live carefree with our family. Random luck can not be influenced, as the name implies. Random happiness is important throughout life and comes suddenly and unexpectedly. Another author once wrote the following line to the luck of luck: ”It kisses you quickly and flutters away”. In general, happiness factors affect personal happiness. Three of these factors are as mentioned here. People around the world believe that you will be happier when your income goes up. And in fact, it can not be denied that money can dissipate part of the worries that you have in everyday life. The rent can be deducted, the insurance paid and the refrigerator filled, hence the physical and safety needs are met. But what remains unsatisfied by money are the social needs. So it is said in the vernacular of ‘You can not buy friends’ and money alone certainly does not make you happy. With the photographer’s submitted photograph for this assignment he respectfully wants to tell the story of happiness being an Indian woman in India. 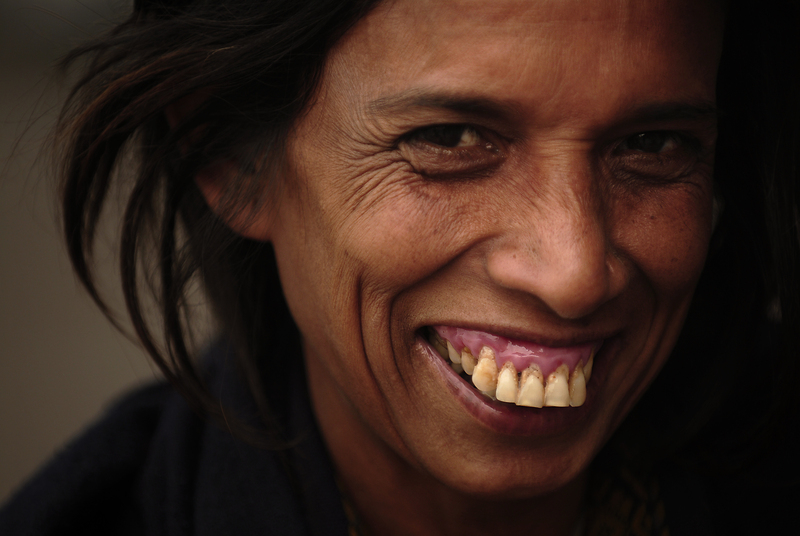 In this portrait an Indian woman is smiling in New Delhi. From the beginning of depiction, the portrait has invited its audience to recognize the identity of the subject and then to remember. In photographs and as human beings we connect, eye to eye, with others who live in places and engage in behaviour and happiness we may not have imagined. ”- One can also give happiness a chance by taking an open attitude towards life and more unexpected events occur that can turn our lives into something positive. One can also consider how one can change our situation and implement it. Learn to laugh about our mishaps or our bad luck, than we will realize that we master even difficult situations better”, the photographer Kristian Bertel says.